Today I am going to do the first Diecast Mustang Monday. Thanks to the best dad ever, I got a spot on his website. I have been interested in photography since I was about 8 (I just turned 11). When I turned 9 my dad bought a new camera, so I bought his old one from him. He took Hot wheel pictures so I took after him and decided to do the same. 2 years later I got a computer and he taught me Photoshop. A couple months later I made my own website. (I’ll include it at the end) I can’t beat his pictures but I try my hardest. 🙂 I have been a fan of Mustangs since I was 5. I started collecting diecast Mustangs when I was 7 and now I have 95. So now for Mustang Mondays I took my dad’s idea and will post a new one each week. 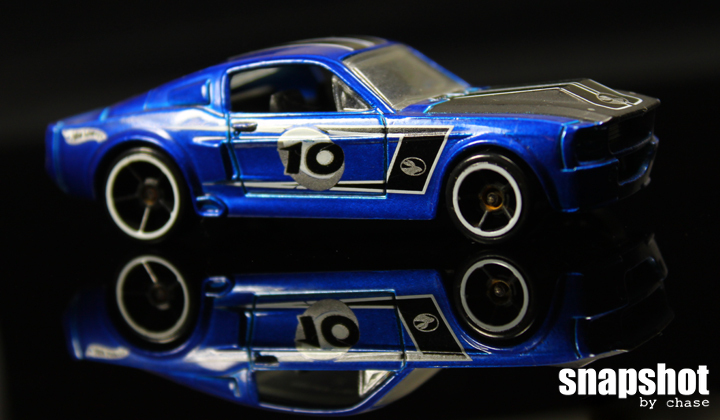 For this week, here is a Hot Wheels 1967 Shelby GT-500. This car was part of the 2010 Easter Eggsclusives series that was available at Walmart for a short time. I remember getting this Mustang for pulling out my own loose tooth. It has sentimental value 🙂 I wouldn’t give it away for a million bucks! Thanks to the best dad ever! Here’s a link to my website if anyone wants to check it out. Check out my other photos! Thanks Mark. He’ll be adding a new post every Monday!